For Malaysians, music forms an integral part of their daily lives. It is no wonder then that the country hosts a plethora of music festivals all year round. 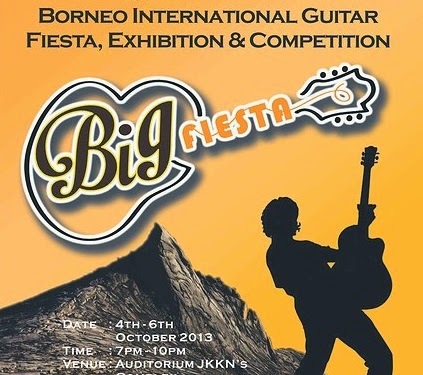 The Borneo International guitar festival or ‘BIG festival’ is yet another new musical extravaganza that was recently held in Kota Kinabalu in Sabah. The festival, which was staged over three days from the 4th to the 6th of October, featured internationally renowned guitar players hailing from five countries. These well-known artists showcased their talents with a series of performances at the state’s JKKN (National Department for Culture and Arts) Auditorium. Big name participants at the festival included Sheikh Hady Masmeih El Manso, the Malaysia Youth Unity Association’s poster boy for the year 2011. Hailing from Kuala Lumpur, the guitarist who is popularly known as Hardy Afro showcased his wizardry, by way of an electrifying performance which also featured Australia’s chart-topping sensation Peter Dickson and nimble-fingered Tom Ward. Also performing at the BIG concert series was University Teknologi MARA’s Classical Guitar Senior Lecturer Nathan Fisher. Originally from the United States, Nathan is currently conducting research to see if traditional Malaysian music and instruments like gambus can be adapted to the guitar. The dazzling concerts at the festival also featured Japanese maestro Yuta Tanaka, a guitarist who is renowned for his awe-inspiring talents wherein he plays complex bass lines, harmony and melody simultaneously. He was accompanied by his compatriot Pukichi, another highly accomplished, award-winning guitarist. Complementing these world-famous talents was Baihana, a jazz trio from the Philippines featuring gifted vocalists Krina Cayabyab, Mel Torre and Anna Achacoso. The BIG festival was conceived by the Sabah Musical-Theatre Society with the aim of allowing the musically inclined youth of Sabah to interact and learn from these music greats by way of the concerts and specially organized workshops, which were held during the festival. The festival also featured the organizational efforts of various local bodies like the Music Teachers’ Training College, Universiti Malaysia Sabah, World Youth Putra Jaya Malaysia, JKKN, the ministries of Youth and Sport and Tourism, Culture and Environment and the Kota Kinabalu City Hall. Needless to add the inaugural Borneo International Guitar festival was a resounding success in its first year of inception.